Things got a little deeper and little more personal this week, with VR prescriptions, holographic jump ropes, Facebook for whales, ocean data and Google kindly blocking ads for us mere mortals. It’s officially the end of the week so get on top of the digital marketing news with the Weekly Wins and sit back with a cold one. In order to combat the dreaded ill-fitting VR headsets EyeNetra’s mobile, smartphone-enabled vision test could possibly help produce vision-corrected VR screens. Ensuring that the people who wear glasses aren’t left out of the virtual experience. Currently VR headsets are not particularly accommodating to frames, and often result in an awkward, ill-fitting experience. The result of removing the extra space according to Springwise, ‘means fully adaptive display would make this unnecessary, enabling a more compact, lighter headset that would offer longer and more comfortable use.’ It’s worth a try. This is a next level work out play called Smart Rope. Need motivating? Skip and watch the count accumulate in front of your eyes. The rope is embedded with tiny LED lights that display a mid-air jump count that looks like a full-blown hologram. Airows kindly shared this gem and in a couple of months our skinnier selves with be grateful for it. Snag one before they’re gone – your leaner and meaner future self will thank you. Another article from Springwise grabbed our attention this week. This time it was about capturing ocean data via surfer’s fins. They have called it Smartfin and it gathers data on ocean quality. Apparently little is known about the shallower coastal waters. It is equipped with sensors that monitor sea salinity, acidity levels and wave motion. If anything it’s excuse to get out surfing more often…..you know, for the planet. The Atlantic published an article titled: Making Facebook for Whales, and it’s all about using facial algorithm to identify whales on the spot. 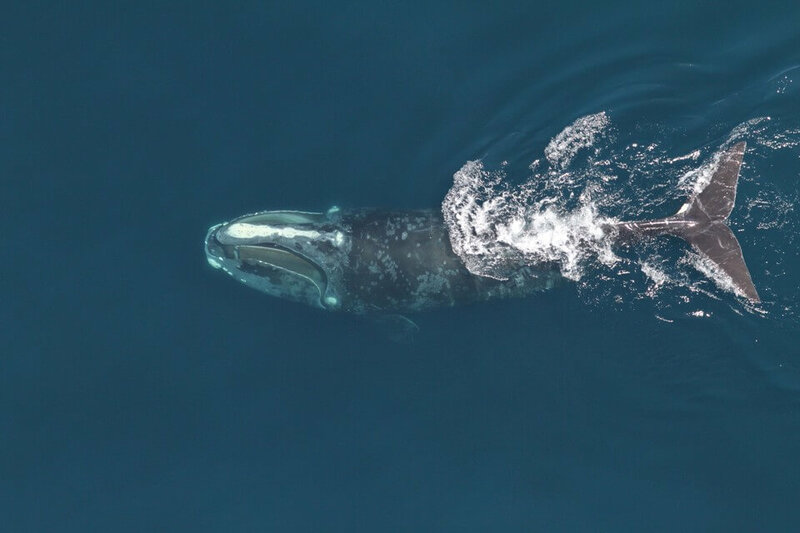 According to the article there are only around 500 North Altlantic right whales left in the world championing them as the most endangered of all whale species. To save them scientists got together to develop an algorithm to identify their faces from a photograph. It’s a win for the nearly extinct and the scientists who work endless hours trying protecting them. Facebook’s algorithms had identified her face. Why couldn’t she have something similar for whales? 5. Google have saved us from 780 million bad ads. This week Google released their annual report on advertising business, and what it saved us from. Google have the ability to block bad ads and just last year they claim they blocked 780 million ads which according to the article in Tech Crunch is an increase from the 524 million-plus it blocked the year before. It’s an interesting read regarding advertising and interruption. It was a fun and slightly more personal week in the digital world, giving us a little more. If you’re looking for a neat piece of entertainment watch below. Because you’re worth it. So they say.